Something most of my clients tell me they struggle with is time management and always being busy. There’s so much to do and it feels like there’s never enough time to do it. Often most of their time is spent in their business, leaving little time to spend on the things they enjoy in their personal life. Time is something both Andrew and I are focusing on this year: how we can spend more time doing the things we want to do while continuing to grow our businesses. Today we’ll share some of the strategies and tools we use for effective time management, and the impact they’ve had on our lifestyles. 7:34 Buffer days versus focus days: Austin’s approach. 9:36 Andrew’s take on buffer days and buffer zones. 13:36 Creating an ideal schedule that works for you. 16:23 The importance of protecting your schedule once you’ve planned it out. 17:19 Building milestones or keystones into your week to keep yourself on track. 20:10 Starting with your “One Thing” and building in the other time management frameworks to create change in your life. 22:22 How giving away control of your time is like giving away control of your bank account. 23:21 Learning how to say NO, or at least no-ish. 26:06 What Austin does before making a decision about a requested meeting or opportunity. 28:18 The benefit of estimating time for tasks and tracking how long things actually take. 30:07 Using time tracking to understand time spent vs. revenue and which tasks are actually aligned with your larger financial goals. 32:11 What Andrew is using as an alternative to email in order to spend less time in his inbox. 33:08 Tools Austin uses to effectively manage his time. 35:19 Time management tools Andrew is using. 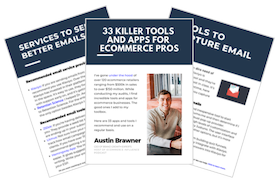 Austin Brawner: What's up everybody, welcome to another episode of the Ecommerce Influence podcast, my name is Austin Brawner. Andrew Foxwell: And I'm Andrew Foxwell. What's going on my man? How are you doing? Austin Brawner: I'm doing well, I'm doing well. I got back from a hunting trip this last weekend, which was a lot of fun. I started hunting last year and for a couple of days with a friend of mine, out into the Hill Country, and it's interesting, you know. Before I started hunting, I thought it was kinda more hunting and less waiting, but it's like 99% waiting quietly. Austin Brawner: Which gives you a lot of time to think and hang out, and it was nice, but it was also freezing cold. It was 28 degrees. So I got some serious time hanging out in the dark, in the morning, in 28-degree weather, very meditative. It was very meditative, but it was also very fun. Andrew Foxwell: Yeah, that's awesome. Well, you went hunting, and I went to Huntington Beach. So, super similar experiences. Austin Brawner: Super similar, everybody knows Huntington Beach is very similar to Texas, central Texas, Hill Country. Andrew Foxwell: Yeah, yeah, yeah. So, hit that up, hit the dog beach, big stuff this weekend, and a big, big Foxwell weekend. So, I know, but I mean look, I have been hunting. I never actually, you know, gotten something or I don't know what you'd say, if you've had a kill, I've never been successful. But I did grow up in Wisconsin, very common, you know, people deer hunting all the time. It was a super big deal. And, I remember when I was dating a girl in college and brought her home one weekend, and she had never seen the Wisconsin deer sort of exposed. I won't go into detail, but it's a lot. Andrew Foxwell: And, you know. Andrew Foxwell: Yeah. Deer exposed, hanging off the back of trucks, et cetera. And, she was from the suburbs of Minneapolis, so, you know, big time, big money. And, she was like, "What is this?" And I was like, "Look. This is what it is. This is what life is, you know?" But this has nothing to do with what we're talking about today. We're talking about how to manage your time strategically while growing your business. Austin Brawner: Exactly. And one of the reasons I wanna talk about it, I mean it was one of the things I was thinking about when I was in the hunting, and spending some time outdoors, was just managing more of my time to be able to spend more time doing the things that I wanna do, while continuing to grow my business. So, that's kinda what I spent a lot of time thinking about this weekend. And, to be able to spend more time doing the things you wanna do, while continuing to grow your business, a lot of this comes down to some strategies that Andrew and I have had, and we've continued to work on over the years. We wanted to share today about time management. Andrew Foxwell: Absolutely. I mean this is the topic, right? Time management. Everybody always buys books on this topic, everybody feels like they're out of time, and really what I realized, and this comes from the first three years in business, it was a struggle. I was always busy, I was always running around, I always felt like I was a victim to the email, and a slave to the email, right? I didn't have control. And, what I realized is, in order to put in, to make the lifestyle I wanted, I have to put in the time. Had to put in the time to plan and be every single day, the part of the plan was, you know, these frameworks that we're gonna talk about today. So, that's a big part of why we wanna go through it, 'cause we hear, this is super common, we hear about this all the time. And, on top of that, last year one of our most downloaded episodes was with Greg McKeown, author of Essentialism, where he talks about a lot of these kinds of similar concepts. So, we'll get into the things that we're using today. Austin Brawner: We got about, yeah we got about five we're gonna run through today, five different kinds of frameworks or ideas that we use, and you wanna kick it off with the first one? Andrew Foxwell: Absolutely. So, the first one is buffer versus focus days. So, this is kind of the way that you work on this, and I have my own buffer concepting, right? So, why don't you go ahead and talk about what this is. Austin Brawner: So, so yeah, we are both are doing, it's funny, we both are doing this independently in our own way. I picked this up from a guy named Dan Sullivan, a strategic coach. I don't know how many years, maybe three or four years ago, and it's something that stuck with me since then. It's the idea of having buffer days and focus days. Buffer days meaning those are the days that I dedicate to tasks that are not, well, let's see, I'll put down meetings, if I have to get a haircut, to personal tasks. Anything that's not necessarily focused, time to move the business forward, I consider those buffer days. And I try to keep about three buffer days per week and two focus days. Focus days, on the other hand, are for moving the big rocks forward in the business. They're the days that I can have four or five hours blocked out to do some deep work on the business. To give you an idea about how this works, just last week, I had Monday, Tuesday, as my buffer days, and I had all my calls with people scheduled for those days. And then, what happened is I had a dentist appointment that got moved around, and normally Wednesday is my focus day, but because I had a dentist appointment moved around to that Wednesday, I just said, "Hey, since I have a meeting there, it's now a buffer day," and I moved, consolidated all of my other meetings that were on Thursday, Friday, into that Wednesday, so I could just keep that focused on all the tasks that would distract me from focusing and moving forward. So, I try to choose between the two of them and give myself about three buffer days and two focus days every single week. Andrew Foxwell: Yeah. I like that a lot. I mean first of all it's reasonable, right? And I think that one thing I hear about when I've talked about this concept with a good friend of mine actually, he works at a pretty big company, that's a really growing company, I think they have 400 employees now. I mean they're really, really growing. And, he thought it was absurd that I was basically saying, "Hey, I'm gonna try to block off working from one to four every day." And, I mean that's gonna be my time, that's gonna be what I call my buffer time. And that's buffer time, it's unstructured time basically. And he thought that was crazy. And I was like "You know, you can do that in your organization. You just have to talk to your boss, get their buy-in, and tell them the why you're trying to do that." Because what happens is, I mean this company, the reason I know this guy, they're a client of ours, and they aren't any longer, but all it was is they're in meetings all the time. They're never not in a meeting, right? So, there's no time to actually have a focus day, there's no time to get work done. And, you have to be really reasonable with yourself about like, if you don't have any time scheduled to actually get this done, or a focus day, when are you gonna do your work and when are you gonna do it well, right? And so, if that's the culture of the organization that's a different thing, and that could be a problem. I mean that could be a break point for a lot of people. But, I think it's important, you know, my buffer, the way that I think about it is, there's kinda two definitions I look at in buffer zones I call them, one is the buffer as you say of saying, "Okay, buffer days are gonna be when I hold calls." For me, the buffer is actually open time. So that would be unstructured, there's nothing there, no calls and things like that. And, what I do instead is I do, I'll do a buffer time if I have big call day, so I'll have, you know, and this Wednesday I have five calls in a row. Okay so, I have buffer time in the morning from 8:00 to 10:30, then I have calls, straight, and I call that call stacking. I stack them next to each other, 'cause when I'm rolling, I'm rolling man. I'm like Matthew McConaughey, I'm just like, "Woo!" And I'm gonna get going. And then I'm gonna do buffer time the next day, and then after that, and then the whole next day, right? So, that's a really big one that I have. Now, in between those calls though, it's important, there are buffer zones in between those calls because inevitably somebody's gonna show up five minutes late, or something's gonna happen, right? The conversations are gonna go longer than they should, so those five calls are stacked in between, or the buffer zones are stacked in between. So, it's kinda two different concepts there. You use the buffer days for meetings, you have the focus days. I just actually just plan more bumper/buffer time in there to make sure that I'm being reasonable with myself and being reasonable with how I actually am gonna get things done. Austin Brawner: Sure. And I think that the key to take away if you're not call stacking or meeting stacking, give that a try right away. Pick a day, stack your meetings and give yourself the freedom, even if you just start with one. I was working with a client, we're starting on working him to have one day a week as a focus day. And, he stacks his meetings in the other ones, but it took a while, it took two weeks for him to move the meetings to give himself that one free day, so he could actually focus on the business. Austin Brawner: So it starts there. Andrew Foxwell: It's not an easy task, I agree. Andrew Foxwell: It might take time, but it's something that I think is big. I think it's important to also mention in episodes like this, this is as Greg McKeown says, "It is a pursuit of being an essentialist, or in pursuit of being better at this," right? We're not saying we're experts at this. These are just things that have worked for us. So that's really important to mention because I wanna make sure I'm not coming off as someone like, "We're experts at time management." It's taken a long time to get to where we are. Austin Brawner: But I would say you're pretty good. Of people that I know, you are very good at time management. Andrew Foxwell: Nah, right. Well, thanks. Austin Brawner: I would say you are very good. So, this isn't coming from nowhere, I think that the reason why you're really good is that you have set a schedule that works for you, which is our number two. Why don't you walk through what that means, how you set a schedule for yourself and how you think about that. Andrew Foxwell: Yeah. Totally. So, I mean, we probably should have started here. Basically, what I say is, a lot of the clients who we work with, you know, they're not getting as creative or there's tactical issues that are happening, right? It's like they're saying, "Hey, we're sold out of this," or whatever, right? Communications, and their frenetic pace and they're not really focused, okay? The first thing I'll go to them and say is, "All right. Let's just back up for a second and stop talking about Facebook ads and let's just talk together about your perfect day. What does that actually mean for you?" And I've done this with friends and family members, like, what do you want it to be? And I'm not saying that you're gonna get there, I mean, I don't know if anybody ever achieves what their perfect day is, I mean in a lot of cases, but what is the perfect day for you? It also, I always tell people it has to include work. You know, people laugh. You have to do some work. So, one, what's that perfect day? What's the ideal schedule? What do you want that schedule to be? When do you feel the most productive, right? For me, I'm very productive in the morning. I have a cup of coffee from my Technivorm Moccamaster, which is the best coffee maker I've ever had. And that thing gets me rolling. And I am good from like 7:00 AM until noon. Okay? So, setting the schedule that works for you, and thinking about what do you wanna be able to do if you really feel like you can work well in the morning and then in the afternoon, that's when you wanna be present, outside, you wanna go to the grocery store and you wanna pick up your kids from school, then do that, right? There's another colleague that I was working with, that was another client, and he wanted so badly to pick up his kids from school every day. That was the reason he had started this business. But he for some reason kept allowing calls to go till 2:30, 2:45, when his kid was at the bus stop at 3:00, and he would have to drive 20 minutes to get there. I'm like, "I don't understand." Just stop taking calls after 1:30, right? 'Cause now you're not rushing and you could make them a snack or who knows, you know what I'm saying? And so, a lot of it is just like actually thinking about what do you want the schedule to be? And that's a big part of it. And, for Gracie and I that means a lot of different things. And, it means, you know, not working on Friday afternoons is a big part of our schedule too, because I'm brain dead at that point in time. So, understanding what that is, how you want the day to go, how you want it to flow, and trying to execute on that. And, setting steps to be able to execute on that. Austin Brawner: And protecting it. I think that is the most underrated part of this whole deal, is you can spend your time planning out an ideal schedule and having an idea of what you want, but if you don't protect it, you're not gonna be able to have that happen. And, similar to you, I'm also a person in the morning who I, I'm way more productive in the morning than I am in the afternoon. By 4:00 PM, my brain is toast and I'm not gonna be able to do very much if anything besides maybe get through a couple of emails. Austin Brawner: A couple of things I like, working out in the middle of the day, so I try to protect that, I block that off well in the future. I blocked off all my workout times for the entire quarter one at the beginning of Q1. Austin Brawner: So that I knew that those things, that was my ideal day. So, I wanna have those blocked out. So, that's kind of where we wanna start. The next one I'm gonna go into is what I call building in, adding in keystones into your week. So, for me this is something that has been really, really helpful, especially back to what Andrew was saying about the pursuit of good time management, right? Because you're never gonna be perfect, it's always gonna be something that you struggle with a little bit, but for me, what's been really helpful has been putting down consistent kinda milestones or keystones, that I can check-in to see where I'm at. For me, that's an end of day review, end of week review, and an end of month review. So, these three things allow me no matter what happens ... Sometimes you get a crazy week and you totally fall off and you're just trying to struggle and to get through it. That's happened a lot. But, the nice thing about that is, if I go into an end of week review and I've had a really crazy review, or crazy week, that review helps me get back on track. So, it helps me kinda center myself and I say, "Okay. What happened this week? What were wins? What were the challenges? What did I leave undone for the next week? What did I learn? And what can I do next week better?" Austin Brawner: And then I plan out the next, the top things for the next week. And that could happen, ideally, I like to do it on a Friday, but sometimes it doesn't happen, right? I had a wedding that I had to fly out Friday morning, so I ended up not being able to do the end of the week review. That's totally fine. I can always kick into that on a Sunday and get myself prepared for the next week. Austin Brawner: And those are the things that for me kinda bring me back to center, and I can kinda move forward from there once I do those reviews. Andrew Foxwell: Absolutely. So, if you go through, I mean and just review what we've already said, and here adding in a little bit more variety on that, if you go through and you set your ... What I do is, what Gracie and I do is we do weekly, well we really have it done daily, but daily, weekly, monthly, quarterly, and yearly goals, okay? And then, her talking about the Greg McKeown hundred year vision of your life. Okay. We started thinking about a hundred-year vision of what your legacy's gonna be, a whole bunch of other stuff falls into place of what you should be doing, okay? So, if you go through that and you plan that, and then you sit down to yourself and say, "All right. That's interesting," and you start to do the reviews that you are doing, Austin, right? You're reviewing them every day, you're saying, "How did I do today to get closer to my weekly goal?" Right? And, our business coach actually has another whole line on here, he does what we call the "One Thing." He has, "what's the 'one thing?'" You can set all these goals for yourself, but what's the One Thing that absolutely has to happen that day, that week, that month, that quarter, and that year, okay? And then, you start building into and you just ask yourself, "What's my ideal schedule? When do I wanna work? How do I wanna work?" And then you start thinking about a mix between buffer zones, like I was talking about, or you start thinking about buffer days and focus days as Austin was talking about, another really good idea, right? If you start doing this type of stuff, it is going to be insane what changes in your life. Seriously. I mean it's gonna be a huge deal because you're gonna have taken your life back. And, life will no longer be happening at you, you'll be in charge of it. And so, I don't know, it's amazing, we're kinda glossing over it quickly, but I think a lot of it comes down to just stacking these things together, right? That review is huge. I mean how many times have you ended a day and you go home and somebody's like, your spouse or your partner is like, "How was your day? What happened?" And you're like, "Honestly, I'm not even sure." Austin Brawner: Yes, right. There's so many distractions. Andrew Foxwell: Yeah. Just review it. Austin Brawner: So many distractions, things popping up, it's very, very tough. Andrew Foxwell: Yeah, yeah. And I think if you start to do that and you start to put in time blocking as a concept, where you're doing, as Austin was saying and you're, you know, marking off time on your calendar to actually get work done and that's it's own task? That's a huge deal. If you give control to people of your calendar, that's where you start to run into an issue. And I've been in that issue, you know, people say, "Does this call work?" Sure. A year ago, and just a personal story, today actually I was in an airport flying for Gracie's birthday, to the middle of Arizona to see a friend, and I was on a call in the airport and then another call came in, trying to launch this project, and what was I doing? Why hadn't that been done before? And I was super frazzled, and nobody's in a good place then. And you're not strategic. Austin Brawner: No. Everybody can feel it and know that you're frazzled and it's not a good feeling. And one thing to think about with all of this and what you're saying about the calendar, or about giving other people control to your calendar, you wouldn't give somebody control of your bank account and say, "Hey, anytime you want to take out $50, just go ahead and take it out." But we do that same thing with our time. Andrew Foxwell: God that's so true. Austin Brawner: And, we allow people to take away our time without even a thought, right? Austin Brawner: We say, "Oh yeah, we could do this, that meeting, okay, yeah I'll do that." And, when you start putting it in, start putting value on your time, you realize that some stranger who cold emails you just got $50 out of your bank account, or $100 or $200, whatever you're valuing your time at. Austin Brawner: And that's a scary thing. And with that whole vision of what you want to achieve and doing those reviews, what I think naturally ends up happening, and something that I focus on as our next kind of piece is, you start to say no to more things. When you start to do those reviews, you start to track your time, and you start to look at what your ideal schedule is, and then you have to ask yourself this hard question which is, "If this is what I want, it's what I've got? What do I have to remove to be able to get from where I am right now to where I wanna be?" Austin Brawner: And, that's hard. Andrew Foxwell: Totally. Well, you know, Greg McKeown is ... This is a big thing he talks about too, right? Saying no. And this is the thing, if you get a life coach or a business coach, inevitably one of the things they'll bring up is saying no. And this is a very challenging piece because I'm a people pleaser, you're a people pleaser, a lot of you listening to this, right? You don't wanna say no, because you're like, "Well, then they're gonna think I'm big-timing them, right?" And so, what it comes down to is if you don't wanna say no, which you don't have to. I mean, you can say no-ish, is how I talk about this, and no-ish means, what are the things that you don't wanna do that you need to outsource? What are the things that are moving you forward or are distracting, as Austin said, you know, that are actually want to be doing in your business and what's totally knocking you off the balance beam? And so, understanding what that is, and then outsourcing those things. This could be things like if you don't wanna sit in on a certain meeting that you have every week, and you could hire someone that's a part-time employee to go be on that meeting, that's not a crazy idea. I mean if they're a competent person, you'd hire good people, you could listen to another episode about how to hire good people, you know, that's how you start to do it. Because remember, you're the business and you need to be running the business with your head on straight. So, if you're ... For me this is things like, this is personal stuff like let's just say cleaning the house, and other stuff is like, okay, outsource that to some degree, right? And then what else can I say no to? It's like saying no to a lot of meetings. Everybody has the issue, I'm sure many of you have experienced this, of the "can I pick your brain meeting," okay. Austin Brawner: So, say no to those. Andrew Foxwell: Well, that's right. Austin Brawner: That can be a hard thing to say no to. But, those meetings need to be, if they're not moving you forward, and they're a distraction, I mean the main thing as a gut feeling I like to ask myself ... If somebody reaches out to me and they say they wanna meet or there's something that I'm asked to do, or an opportunity comes up, I have to, this one thing ... First thing I do is I sleep on it before giving a decision, and then I really trust my gut and I say, "Is this like a really like a hell yes? Do I really wanna do this? Or is it no?" And, if it's not something that compels me so much to do it, I'm gonna say no. Andrew Foxwell: Sure. Well, I think this is another ... I mean there's a podcast listener and a colleague that you and I have, Eagan, who's a friend of mine in Madison, and all the time people are like, "Eagan, can I hop on, I wanna tell you about my business and see if you're a right fit." And Eagan now has a 15 question survey that helps him assess if they're a right fit or not. And if they're not, he hands it to another agency. And you can do that, I started doing that for certain coffee meetings. I have this thing, it's like, what do you wanna discuss? What's interesting about this? What's not? And I think you're right. Sleeping on it before you say yes is insane. That in alone is a great tip for sure. 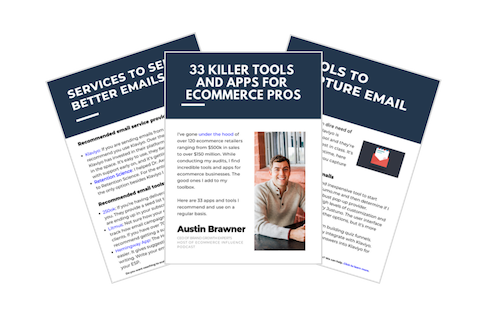 Austin Brawner: So, it's tough too when you're going through email and you wanna just respond to emails. Austin Brawner: And, it's gonna be more work to say no than it is to say yes, then that's, I mean that's something that, you know, don't get into that habit. Say no. Sleep on it and come back the next day. Austin Brawner: But, ultimately I mean it comes down to just really trying to be more comfortable saying no and understanding that yeah, you might disappoint some people, but it's not going to matter in the whole scheme of things. And, it'll help you get to the end of the year and look back on it. I used to pack my schedule to the absolute brim, sometimes it's still like that, but I've really tried to stay away from that because I know that if it's packed to the absolute brim, my stress level's gonna be at a point where I'm not gonna be effective. And so, giving myself a little bit more time is something that I just feel like it's totally worthwhile. Andrew Foxwell: Absolutely. And time goes into the final point you and I have of estimating time for tasks and then tracking your results of that, right? So, I know you use a certain to estimate kind of the time something will take, can you talk about that? Austin Brawner: Yeah, so this is something I picked up from ... I hired a productivity coach named Chris Sparks, I would say like a year and a half ago, maybe two years ago, and it was really helpful. One of the things that he got me doing, which I've continued to this day, is picking tasks and then estimating the time that that task will take before I actually execute on it, and then tracking if I was on point or if I was overestimated or underestimated. For me, I would generally underestimate the time, I still am this way, I'm an optimistic person, so I'll generally underestimate the amount of time it would take for me to do a task. So, what I'll do now is I'll use a Pomodoro, if you guys aren't familiar with what a Pomodoro is, it's like a basically a timer that would be a cycle of 25 or 30 minutes and then a five-minute break. So, I estimate the number of Pomodoros, a number of 25 minute periods that'll take to do a task, then I start working on it. And then at the end, I track did I actually hit my time? Or did I over or underestimate? As I do that over time, it gives me a better idea of how long it takes me to do some of these tasks, so I get better at estimating and I don't over-assign projects to myself. Andrew Foxwell: Nice. Yeah, that's awesome. I mean, I should actually do that, I don't estimate the time for tasks. I have been tracking my time to the minute of everything that I do, for two years, and it's done a couple of interesting things. One is it helps me understand that time spent versus revenue, so for me it's like, even if you're not paid hourly, which sometimes we are, sometimes we're not, we have an idea of what the hourly rate is. If you've never done this, I would recommend looking at how much you pay yourself over a year, how many hours you're working on what tasks, and I can guarantee you there are things that you're gonna be working on that are not aligned with where you're gonna make the most money. This is it, right? Austin Brawner: 100%. And that's a 100% chance that you're working on stuff that you shouldn't be working on. Andrew Foxwell: The forecast looks gray in that regard. I mean it was shocking to me, it was a slap in the face when I first did this. Cause I was like, "Oh gosh, I am just..." you know what I was doing? Honestly, I was spending a ton of time actually responding to email. And, I was just sitting in my email and my email used to be up on my computer all the time. On my browser, my email's always open, which was a disaster. It's setting yourself up for total failure, right? So, that was a big problem. So, now we look at it and actually I can probably say that in 2018, looking at the time spent versus revenue, of the clients that we worked with and the other things that we're doing, it actually aligned pretty closely. So, that's how it should be, right? There's a client of ours that was about, they're a big client of ours, they're about 15% of our revenue, and I spent 16% of my time on them, okay? Perfect, that's great. 'Cause I feel like there's days I'm like, "God I'm spending a lot of time on them." Right? So, we do check-ins on this quarterly now, and it's been crazy what we do. And, there's still time doing things, but what we've done actually in a lot of email stuff, is we have brought most of our client communication onto Slack. And now people can ping us and ask us questions and then I have time built into my calendar where Slack is basically, I'm responding to Slack. It's in my buffer time, and they're communicating and chat with people. And, that's been huge. Because then it's not like it's coming through email, we gotta answer it. On Slack, I'm on there and my colleague Shane is on there who edits this podcast, and he's able to respond, and it just works really well. Gracie's on a lot of it. And, then it's like we can tag team it a little bit and they feel like there's a full team behind it, even though it's our little agency. So, I think your point about estimating the time for tasks, huge idea, tracking your results, that's something I think I'm gonna do. And then if you can understand that time spent versus revenue and start calculating that, it'll blow your mind. I think you're really, really gonna love it. You have a lot of tools though for planning, I mean going through time management, maybe more than I do. What are some of those that you use? Austin Brawner: Sure. So, a couple of tools that I use on a day to day basis, one of them is called Freedom. Freedom allows you, if you haven't used this before, it allows you to block distracting websites, block distracting apps, and you could download it and you can set times in advance when certain things are, like a block list, and then have that run consistently over a period of a day or when a certain time amount gets hit. So, I've got from I think like 6:00 AM to 4:00 PM. A lot of the distracting websites are blocked. Then outside those windows, I can actually use them, but they've blocked the ones that are gonna keep me from doing work during that time, I've got them blocked. Another one that I really like is called Be Focused. Be Focused is a little extension or it's a little app that allows you to do Pomodoro timing. So, I mentioned that I used Pomodoro's estimated time a task will take and then I actually do it. So, what I'll do is I'll estimate it, then I'll start my Pomodoro timer on my computer, go for 25 minutes, take a break for five minutes, go for 25 minutes, take a break for five minutes, and that works really well. And, that's paired with, there's something called a, I believe the name is a productivity journal ... By Intelligent Change, the Productivity Planner. Austin Brawner: So, I've used that one, I've also used the Panda Planner, both of those are awesome and they kinda help me a little bit more, a little bit more tactile. I like to be able to use that journal to be able to track what I do each day, and it also has that weekly review built in there. And, I'll have all of those, those three tools up in the resource. You got a couple of tools as well here. Andrew Foxwell: Yeah. I use Tracking Time and Slack is really the big one. I actually have worksheets, our own worksheets that our business coach gave us that we still use, and all that does is it has you list out your, on the top, as we talked about the daily, the weekly, the monthly, the quarterly and the yearly vision, and you rewrite them every week. It's a worksheet a week. And then in the week, you list out your tasks and there's only boxes for five personal and five business per day that you list and then you check them off. So, that's what I use to translate. Austin Brawner: Could you take a picture of it? Austin Brawner: Put it in the notes? Andrew Foxwell: Definitely. Definitely. I'll link to it for you and link to our business coach's website too, Freedom Business Family, his name is Chris Rudolph. Awesome dude. So, yeah I'll link some of his resources, but it's nuts what that's been able to do. So yeah, hopefully, this has been helpful for you and I know that this is a little bit longer episode than a traditional flash episode, but it's something that Austin and I care a lot about and talk a lot about, and we look forward to helping you gain back more of your time. Austin Brawner: Absolutely. We'll talk to you guys in the next episode.